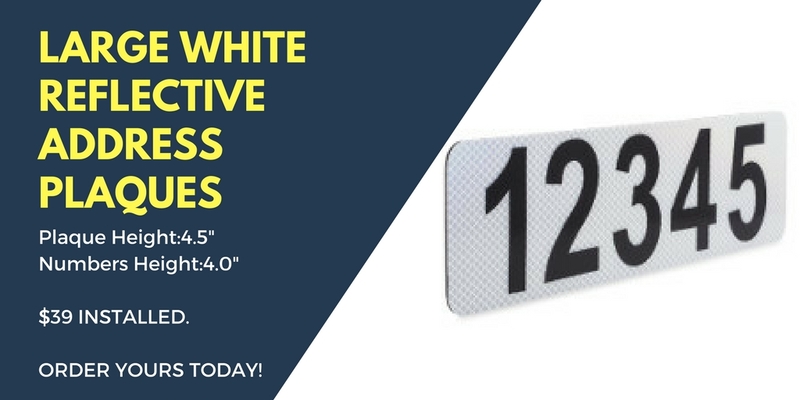 Large White Reflective Background with Black Numbers. Flat Plaque for Curbs. Plaque Height:4.5″ Numbers Height:4.0″ Volume Discounts Available. Slim and Trim Black Plaque with White Reflective Numbers. Flat Plaque for Curbs. Plaque Height: 3.5″ Numbers Height: 3.0″ Volume Discounts Available. Simply click on the request service button below to order. We will install your reflective address right away! (Free mobile installation service throughout San Diego County included.) All work is satisfaction guaranteed. Our very reflective address plaques will provide your community a consistent and attractive neighborhood appearance that most community managers and home owner’s associations desire. Now, everyone can have the same look (and safety) for their curb numbers. Our reflective curb address products are built to last. With numbers that are rated to last over 10 years and a plaque that is UV-protected, you can rest assured that these plaques will last through even the worst weathering. In many neighborhoods it can be difficult to find a home by its address. Our high visibility address plaques can be seen easily day and night so everyone can find homes in your community quickly and safely. No More Paint or Stencil Look! Because we have had such great feedback and overall success with our reflective curb address, we rarely even offer traditional (stencil look) curb address painting service. The main reason that more and more people are choosing our reflective curb address plaque installation is because it looks much more modern and attractive. 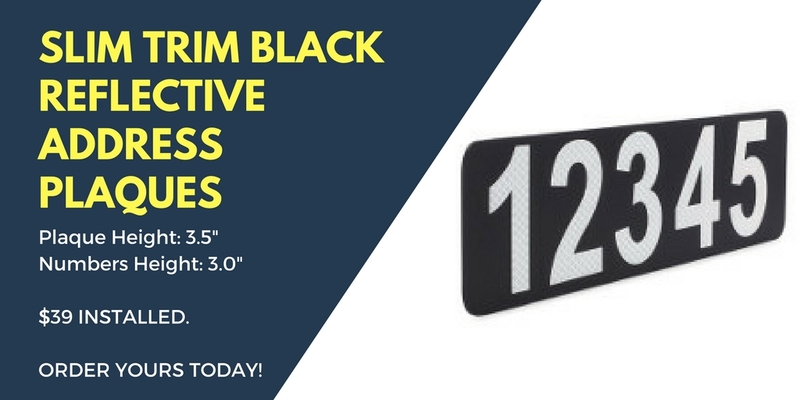 Using the same bright reflective technology as a freeway exit sign, our very reflective curb plaque is simply the better choice as it definitely easier to read and it can be seen much better at night. Our reflective curb address plaque installation service is priced just about the same as a traditional spray painted curb address. Also, because it lasts much longer than spray paint. This will save you money in the future as you will no longer have to re-paint your curb address ever again! Our state of the art reflective curb address plaques will give your home or HOA the added safety and visibility you deserve. Also improves the appearance of your home or HOA with a much more modern look. Durable (10 year rated) 3M reflective material lasts much longer than typical outdated spray painted curb addresses. Recommended by police and fire departments because of much better visibility. Order your reflective curb address for added safety in case of an emergency! Copyright © 2018 Curb Painting San Diego.